How did I not know this was here? It’s in an old garden bed about twenty feet from the barn. Because of my green pinky, I haven’t been faithful in taking care of this particular garden and in recent years the blackberries have taken over. I reap the reward of blackberries so that’s not a bad thing. But until they’re in season, I don’t pay much attention. Aha, therein lies the problem. Not paying attention. Not taking the time to notice what is in front of me. But that’s OK, because when I do notice, I love the surprise. This leaf is what made my heart beat with joy. Yes, the ribs extend from the main vein to each tooth. But notice the large dips between teeth in the above example. Back to Exhibit A: While the ribs also extend from the main vein to each tooth; the difference is in the teeth. 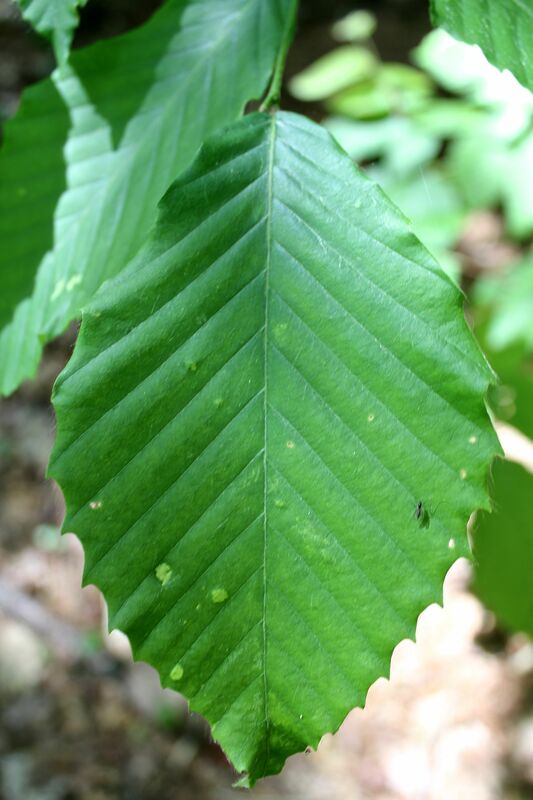 In this case, there is a smaller tooth beside each bigger tooth along the leaf’s outer edge (aka double-toothed). Exhibit B: Not the case. 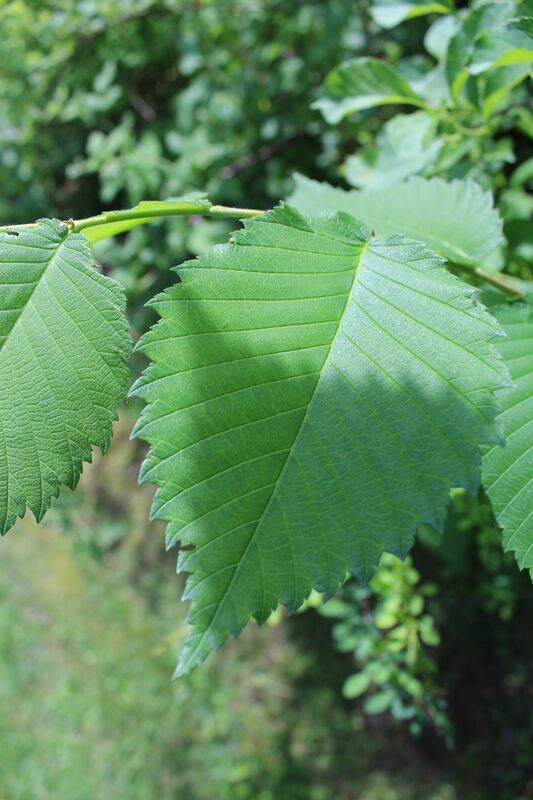 Exhibit A: Do you see the asymmetrical base where the leaf stem (petiole) attaches to the tree? Exhibit B: Symmetrical at the base. 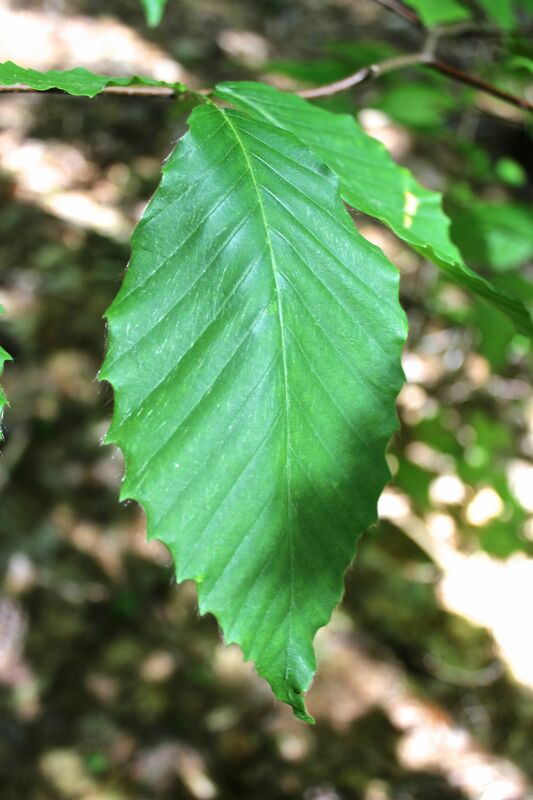 Exhibit A: While both trees have alternate branching and hairy leaves with teeth, another distinguishing factor is that the leaves of Exhibit A are sandpaper coarse. 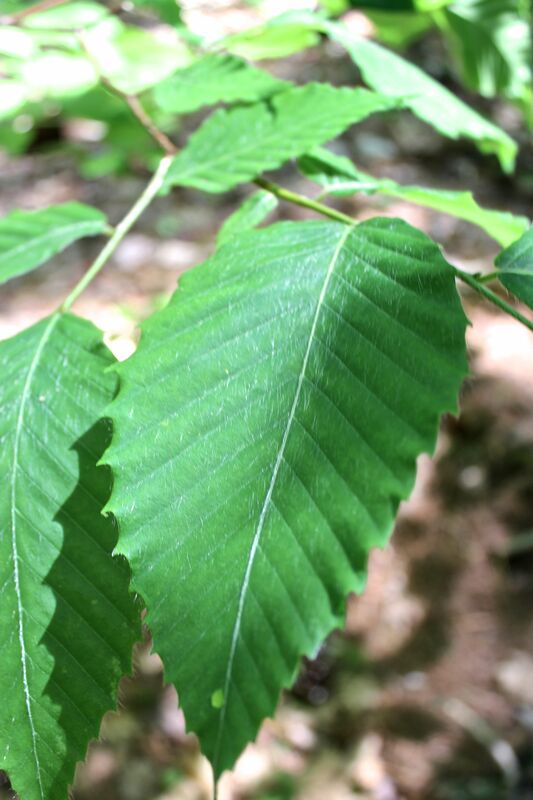 Those are just a few of the key features to look at when distinguishing between a beech and an elm. 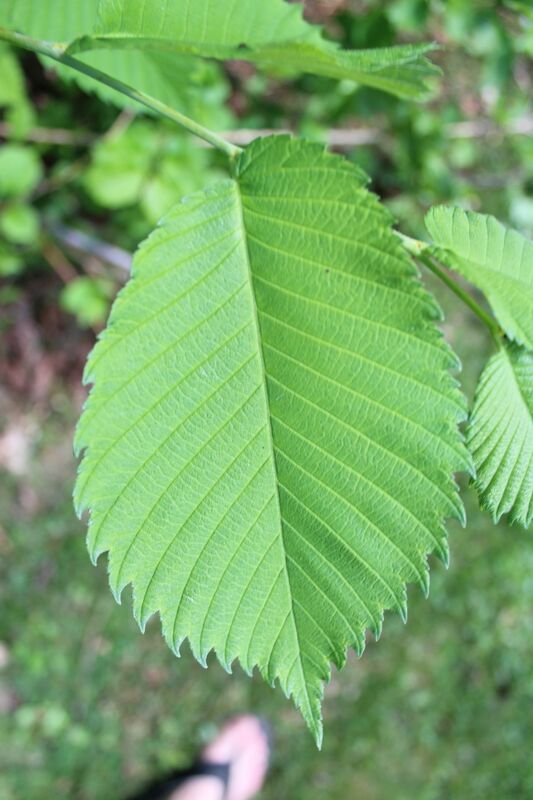 I’m not a forester, but this tree appears to be an American Elm. I’m so glad that my green pinky has kept me from managing the garden where it grows. I grew up just outside the Elm City of New Haven, Connecticut. 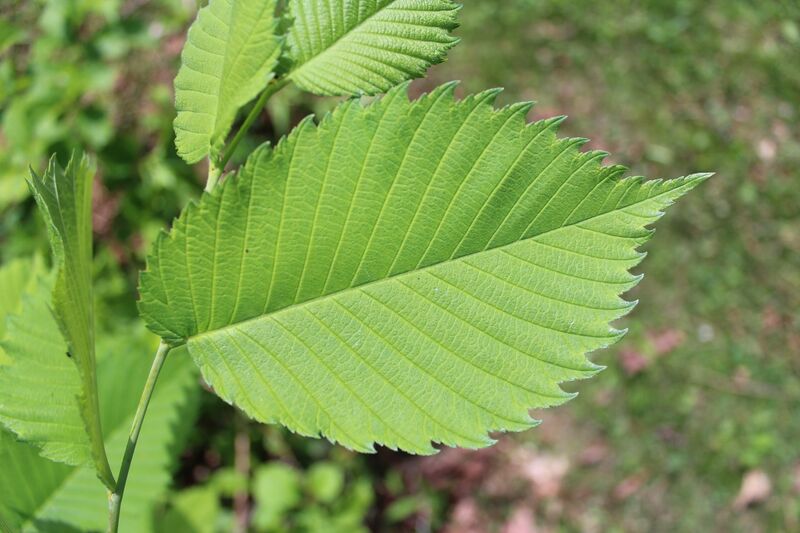 Today, it is the Elm City in name only as Dutch elm disease played havoc with the beautiful old shade trees that lined the city streets. It didn’t just happen in CT either. I’m so glad that I opened my eyes. 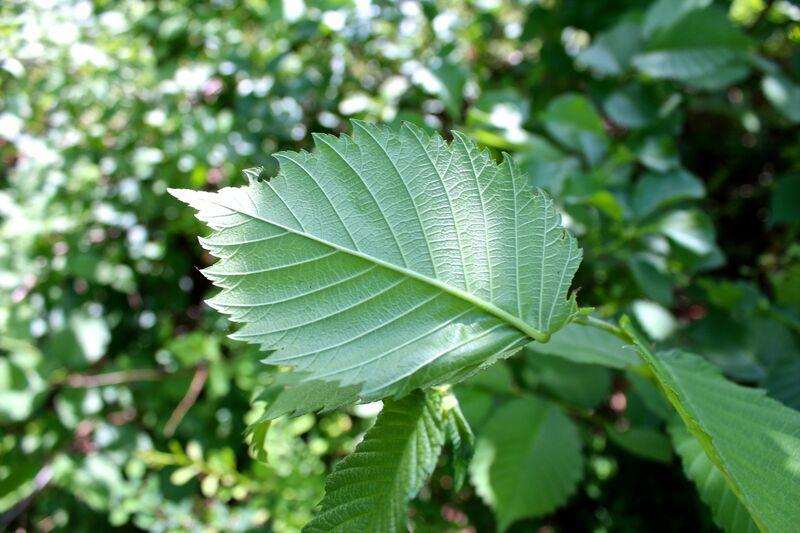 I’m so glad that I touched the leaf. I’m so glad I reaped another reward this week. 1. Pink Lady’s Slipper in the backyard. 2. American Elm in the side yard. I can’t wait to make another discovery. I hope you take time to wander about your yard and wonder. It’s about 12 feet tall and the circumference of the main trunk is 4 inches. Not sure what its future will be.